The economic development of Vietnam depends heavily on the maritime transport industry. It is observed that the value of merchandise exports and imports exceed its gross domestic product. Intense competition among more than one hundred ports in Vietnam demands efficient port management to maintain competitiveness. 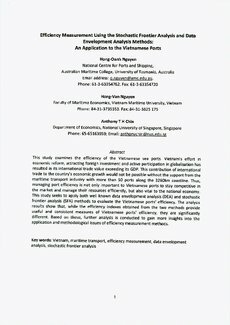 This study applies both the data envelopment analysis (DEA) and stochastic frontier analysis (SFA) methods in evaluating Vietnam’s ports’ efficiency. The results show that, while both methods provide useful and consistent measures of port efficiency, there are significant differences between the actual efficiency indexes obtained from the two methods. Building upon this result, further analysis is performed to gain more insights into the application of efficiency measurement methods. Methodological implications are also discussed.